Many Once upon a time, in a large Indian village on the border of a lake, there lived an old man who was a widower. He had three daughters. The eldest was jealous, cruel, and ugly; the second was vain; but the youngest of all was very gentle and lovely. Now, when the father was out hunting in the forest, the eldest daughter used to beat the youngest girl, and burn her face with hot coals; yes, and even scar her pretty body. So the people called her "Little Burnt-Face." When the father came home from hunting he would ask why she was so scarred, and the eldest would answer quickly: "She is a good-for-nothing! She was forbidden to go near the fire, and she disobeyed and fell in." Then the father would scold Little Burnt-Face and she would creep away crying to bed. Then all the girls from the village-except Little Burnt-Face and her sisters-and all the girls for miles around hastened to the wigwam, and walked along the shore of the lake with his sister. And his sister asked the girls, "Do you see my brother?" And some of them said, "No"; but most of them answered, "Yes." Then his sister asked, "Of what is his shoulder-strap made?" And the girls said, "Of a strip of rawhide." "And with what does he draw his sled?" asked his sister. And they replied, "With a green withe." Then she knew that they had not seen him at all, and said quietly, "Let us go to the wigwam." One day Little Burnt-Face's two sisters put on their finest blankets and brightest strings of beads, and plaited their hair beautifully, and slipped embroidered moccasins on their feet. 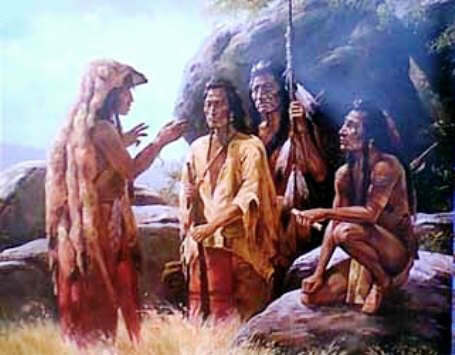 Then they started out to see the Great Chief. As soon as they were gone, Little Burnt-Face made herself a dress of white birch-bark, and a cap and leggings of the same. She threw off her ragged garments, and dressed herself in her birch-bark clothes. She put her father's moccasins on her bare feet; and the moccasins were so big that they came up to her knees. Then she, too, started out to visit the beautiful wigwam at the end of the village. And when she reached the lake, her sisters saw her coming, and they tried to shame her, and told her to go home. But the Great Chief's sister received her kindly, and bade her stay, for she saw how sweet and gentle Little Burnt-Face really was. Then as evening was coming on, the Great Chief's sister took all three girls walking beside the lake, and the sky grew dark, and they knew the Great Chief had come. And his sister asked the two elder girls, "Do you see my brother?" "Of what is his shoulder-strap made?" asked his sister. "Of a strip of rawhide," they replied. "And with what does he draw his sled?" asked she. And they said, "With a green withe." Then his sister turned to Little Burnt-Face and asked, "Do you see him?" "I do! I do!" said Little Burnt-Face with awe. "And he is wonderful!" "And of what is his sled-string made?" asked his sister gently. "It is a beautiful Rainbow!" cried Little Burnt-Face. "But, my sister," said the other, "of what is his bow-string made?" "His bow-string," replied Little Burnt-Face, "is the Milky Way!" Then the Great Chief's sister smiled with delight, and taking Little Burnt-Face by the hand, she said, "You have surely seen him." She led the little girl to the wigwam, and bathed her with dew until the burns and scars all disappeared from her body and face. Her skin became soft and lovely again. Her hair grew long and dark like the Blackbird's wing. Her eyes were like stars. Then his sister brought from her treasures a wedding-garment, and she dressed Little Burnt-Face in it. And she was most beautiful to behold. After all this was done, his sister led the little girl to the seat next the door, saying, "This is the Bride's seat," and made her sit down. And then the Great Chief, no longer invisible, entered, terrible and beautiful. And when he saw Little Burnt-Face, he smiled and said gently, "So we have found each other!"